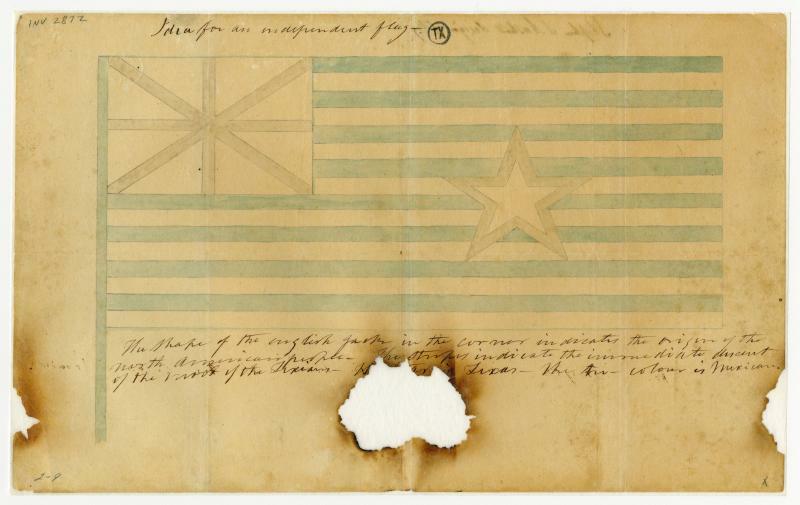 Though no drawings exist, contemporary accounts of revolutionary Texas indicate that the Texans used a modified version of the American flag as their standard, with thirteen stripes of red and blue along with a single Lone Star in the blue canton. In November 1835, Stephen F. Austin, the “Father of Texas,” was selected as part of a delegation to go to the United States to seek weapons, loans, and volunteers to help the Texans fight against Mexican rule. Austin suggested this flag design, which modified the simple design in use to incorporate additional symbolism, including an English Union Jack in the canton and Mexican tri-colors.